The 1950s were a comfortable time for the Walt Disney Company; they knew how to cater to 1950s audiences. Their movies are perfect representations of the decade. By the time the 1960s rolled around Disney was starting to lose their footing (before completing failing at representing the zeitgeist) and started looking for new ways of staying relevant. 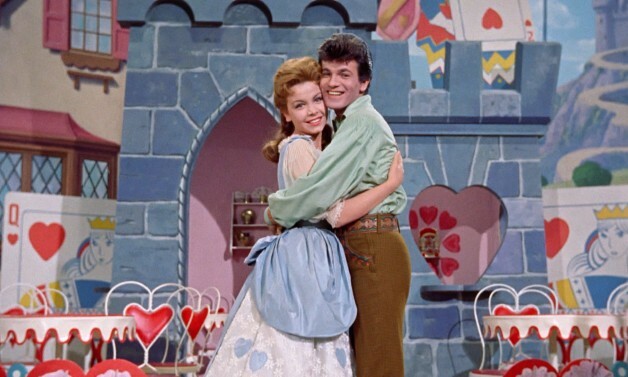 The story follows Tom (Tommy Sands) and Mary Quite Contrary (Annette Funicello) on the eve of their wedding. When the villainous Barnaby (Ray Bolger) kidnaps Tom to marry Mary for her inheritance, the duo ends up in the world of Toyland helping the befuddled Toymaker (Ed Wynn) make toys. Disney had done adaptations before. The entire foundation of their animated studio was based on adapting outside work, after all. But this was the studio’s first attempt at adapting something without changing the songs and general source material. Although this is a loose version of 1903 operetta, the songs were lifted directly and placed in the movie. Unfortunately, production was a bit of a mess from jump, with long-time Disney animator Ward Kimball being fired as the film’s director, replaced with television alum Jack Donohue (who also voices the talking goose in the film). The film’s disappointing box office stopped Disney from tackling another big-budget musical till Mary Poppins in 1964. Disney’s discouragement makes sense because there’s only so much that can be blamed on its being a 1960s fantasy musical. If anything, Mother Goose’s (Mary McCarty) opening line about “set[ting] your imagination free” seems content to banish any questions about the plot. From the beginning you’re left wondering if this is meant to be a play or not. Opening with a curtain rise, a stage and obvious two-dimensional backdrops is reminiscent of Rodgers and Hammerstein’s Cinderella. Brigadoon this is not, and yet the film never acknowledges why the entire movie looks so cheap. There’s actually little consistency and absolutely no world-building. We’re placed in a nondescript locale that can only be envisioned as some type of Mother Goose land, although the non-Mother Goose character Barnaby supposedly controls everything. And though the town looks vaguely Medieval, at least two of Barnaby’s songs discuss rent and income tax. Disney was the master of creating immersive fairy tale settings, this should have been like shooting fish in a barrel! The actual tangible sets like a pumpkin house, Mary’s garden, and the Toymaker’s house are all well done, and served as a walk-through attraction at Disney for the year of the film’s release. Even an angelic choir reciting the “Mary, Mary Quite Contrary” poem reminds audiences of “Second Star to the Right” and other classic Disney songs, yet the script doesn’t appear interested in retaining any of those passe elements. The operetta’s original songs are far removed from the jubilant, toe-tapping numbers Disney was best known for (and it wouldn’t be till the aforementioned Mary Poppins that the Sherman Brothers would become the studio’s in-house songwriters), ranging from the dourness sung by Barnaby and his henchmen, to the slightly more upbeat numbers that try desperately to come off like 1960s pop standards. This is one of the big drawbacks of having pop star Sands and Funicello (billed here as simply Annette, pre-Beyonce) who sound so of their era. Funicello, despite her beauty and grace, sounds perpetually auto-tuned. I wasn’t sure if this was a 1903 operetta or The Parent Trap. We can’t ignore Ray Bolger as Barnaby because his presence sets the tone for what Babes in Toyland desperately wishes it was – The Wizard of Oz. In the wake of the 1939 musical countless films from other studios tried to replicate Oz’s success with the most infamous being Shirley Temple’s The Blue Bird (1940). 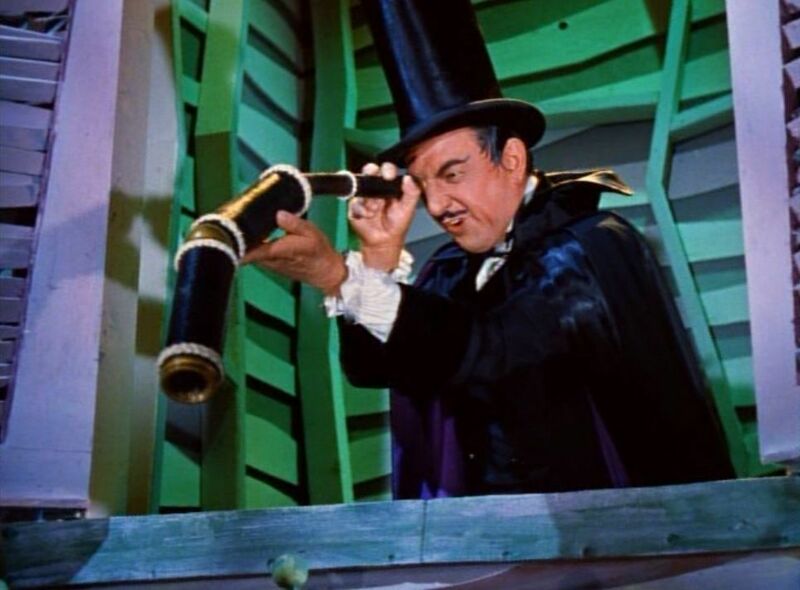 The fantastical elements and adaptation of a popular turn-of-the-century work aside, Bolger’s character acts as both the Scarecrow and The Wicked Witch of the West but comes off like the love child of Vincent Price, John Astin, and the Child Catcher from Chitty Chitty Bang Bang (1968). He nails the humor – “let us plot” – but much like the rest of the film there’s no consistency to his character. He breaks the fourth wall in the beginning, never to do so again, and his various schemes serve as precise narrative shifts. There are three movies mashed within the film: the kidnapping of Tom, the saving of Toyland, and the destruction of Barnaby and all three begin and end with little catharsis or payoff; the script is just done working with them. This laziness comes off worst in the kidnapping of Tom. In an exposition dump Barnaby reveals that Mary will be wealthy, for reasons, and that her “sheep support her” as a means of income. There is also some explanation of why the children live with her, and I doubt it has anything to do with the “Mary Quite Contrary” poem. After Gonzergo and Roderigo (Calvin and Sheldon) dump Tom at the gypsy camp Barnaby announces the gypsies will be arriving to celebrate his impending nuptials to Mary. This brings Tom back, of course, within a few hours in the film’s narrative time. Why Tom would play into the gypsies act, dressing up as an old woman (whose “breath doesn’t reek of salami…” one of the film’s ruder moments) and, hey, reveal who kidnapped him, is beyond me. With Tom being saved the wedding can procee…..wait, there’s still an hour left. The babes finally make it to Toyland at the hour-mark, leading to a new movie with the same characters. Ed Wynn’s Toymaker gives the film a much needed boost courtesy of his zany pep. He’s complimented by a frazzled Tommy Kirk as his assistant. Kirk, for his part, looks like he’s…..drank a lot of coffee (this is a kid’s film). The Toyland half of the film seems to have purpose and makes up for much of the rough first act. The stop-motion wooden soldiers sequence is great – Disneyland would take the soldiers and implement them into their Christmas parade – and all’s well that ends well; it’s just sad that the second half couldn’t have been the entirety of the film. Babes in Toyland gets a pass from many for being “a 1960s Disney musical,” and I get what they’re trying to say. The 1960s musicals always seem a step removed from the current time, and though the plots are nonsensical the characters are relatable and endearing, and things move along. Babes in Toyland shows Disney’s distaste with being out-of-control. The characters are flat at best with actors that range from passable to anachronistic; there’s no consistency in the narrative presentation, and the pacing’s thrown off by confusion over the plot. Disney would save face a few years later, thank goodness. The movie was promoted on Disney’s television program with a wrap party that was far more entertaining than the movie proved to be. If they could have captured the fun on display for the program they might have had something worthwhile. Haha, gotta love when everyone celebrates the end of filming more than the finished product. Okay, Time wins for the best put-down I’ve ever heard! They definitely honed their style by the time of Poppins, but it’s just hard to shake off how lazy this whole feature feels. Maybe Walt already knew something by the time filming happened? Yessica: My advice is to preserve your childhood memory and never look at Disney’s Babes again; better to content yourself with Mary Poppins. If you simply must hear the Victor Herbert music, try checking out Laurel and Hardy’s March of the Wooden Soldiers instead. I don’t remember the movie all the way because I was a young child but what i do remember is the soundtrack. As someone who wasn’t allowed to watch a lot o movies, I depended on my LP’s for entertainment. I listened to it over and over again. And I loved those songs. They were scary and fun and told the whole story as I remember it. That was my favorite thing about Disney, That by listening to the soundtrack you could understand the movie. So terrible sets, lousy acting and incomplete plot lines were not in my memory, only the wonderful score. I totally remember those old Disney albums. I wish they did more of those.